paperback. 75 pages. black and white. 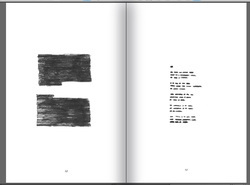 These poems by many different authors aren't censored, they're shadowed. They slip though the copyright barriers and also slip though the mind. Yet they still occupy space. It is the space surrounding poems that continues to inspire me.